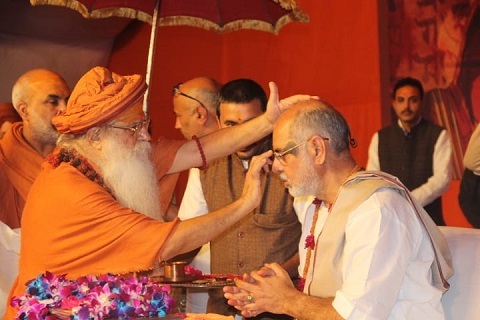 Shrimad Bhagavat Katha by Pujya Bhaishri at Prayagraj Kumbh began on 27th January 2019. 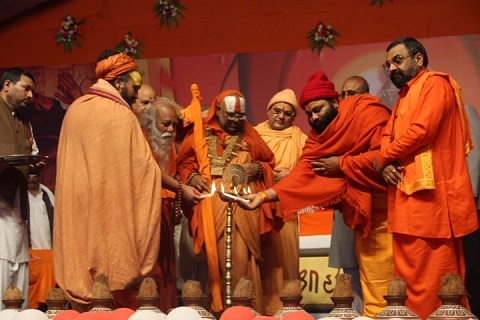 The Katha commenced amongst many divine saints such as Jagadguru Shri Ramanandacharya ji and Shri Hansdevacharyaji who kindled the auspicious lamp. 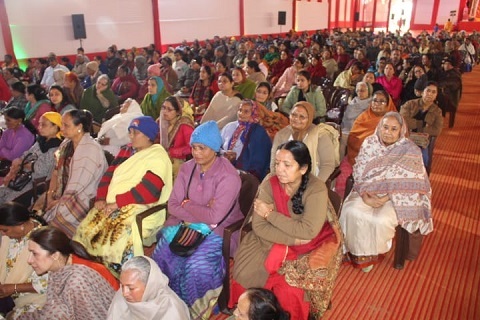 Shri Rajendradasji Maharaj, Shri Govinddevgiriji Maharaj, Pujya Shravananandji Maharaj and Pujya Guru Sharananandji Maharaj gave inspiring speeches on the occasion of the birth anniversary of Shri Ramanandacharyaji on the first day of Bhagavat Katha. 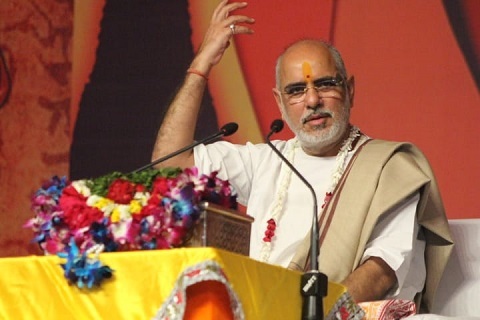 Read below a summary of points shared by Pujya Bhaishri on day 1 of Bhagavat Kumbh Katha. There is a confluence of three rivers in Tirtharaj (the king in pilgrimages) Prayagraj. Shrimad Bhagavat is also the king in pilgrimages: it was written on the banks of Maa Saraswati; it was seen first and then written. This is how a narrator narrates katha. A narrator sees the entire Vraj infront of him before narrating a katha. Similarly, a picture is formed in your mind when you listen. What was written at the banks of Saraswati? The leelas (pastimes) by God that were performed at the banks of Yamuna. Then Shukdevji narrated this Katha at the banks of Ganga. Hence Bhagavat is a tirtharaj which has come to meet another tirtharaj, Prayag. Shri Bhramalin Sharananandji Maharaj used to say: “What is satsang? Renouncing the known untruth.” Doing satsang yet having faults at the same time such that there is no improvement means satsang has not been fruitful. Katha is to see our own faults. We may fail in our efforts to improve others but we will never fail in continuous efforts combined with God’s grace in improving ourselves. Swami Ramanandacharya had no discrimination against race and caste. He spread one main message: One who worships the Lord becomes the Lord’s. Hence, this is a good base for our katha.